We have always made a big deal out of giving things we don’t use anymore away. I don’t believe in holding onto things for a rainy day, especially when we don’t have room at our house to store things we don’t “need.” I always ask myself this question: what are the chances someone else needs this item more than I do? Almost 100% of the time, the chances are pretty good the item needs to have a new home. If I really needed it… I wouldn’t be asking myself the question. A step beyond that is assessing the things I can give away that aren’t extras in my life. Those things are usually things I like and want but they are also things I know I don’t need. It can actually hurt to give up some of those things… but that’s what sacrifice is all about. About every three months, we have a “clean out” day where we all go through our stuff and see what can go. Little Brett is part of that process. He is getting to the age where he fights it a little more than he used to but I think it is a good learning experience for him regardless. He will pick out the toys he doesn’t really play with anymore and we will talk about how another kid who doesn’t have much would really enjoy it. I let him bag his stuff up then we go to the mission and he gives them the bag. Most times, he is happy about it and feels good. He also sees that his mommy and daddy do the same thing… and we talk about it, so I think that makes a big difference too. The other day Brett, who is four now, had a melt-down out of the blue. And it was the real thing… tears marking real sadness just flowed from him. At first I thought he was just “acting” but then I realized he was experiencing a brand new feeling he had never had before… it was the feeling of regret! Right before this past Christmas, Brett had gathered some toys and books he was ready to give away. We ended up giving it to the man who helped us rake leaves one day (if you haven’t read that story – here’s the link:“The Stranger” scroll down a little.) One of the things Brett gave away that day was a Thomas the Trai n Whistle and Wheels Couch he had gotten for Christmas in 2008. To be honest, I was surprised he was willing to give it up because it was pretty cool. The truth of the matter was, it was too small for him. He is a very tall boy and it just wasn’t sturdy enough to hold him up. I think there was more frustration for him than joy when it came to trying to enjoy it. Anyway, he decided to give it away. Fast forward to his melt-down the other day.., it had been 4 months since he gave his Thomas couch away and all of a sudden, he wanted it back. He asked me where it was and when I reminded him he had given it away, he simply couldn’t handle it. He asked when he was going to get it back… he said he didn’t mean to give it away “forever and ever.” This had NEVER happened before so I was a bit shocked. My heart began to ache for him as I saw how deeply saddened he was over this. I gently told him the truth of how it didn’t belong to him anymore and told him how nice he was to have given it to someone in need. Of course, that didn’t matter, he was flat out upset… inconsolable. I wanted to hug him but he wouldn’t let me. He cried and cried repeating, “I want my Thomas couch back” over and over. Man did that bring up memories for me!!!! I could so relate to this four year old mourning a decision he had made. Of course, four year olds don’t understand consequences… and I have to be honest, I’m not that much different than a four year old in ways. My alcoholic brain makes consequences difficult for me to comprehend (that’s why I have a sponsor who helps me figure that stuff out). It was painful for me as a mother to watch this life lesson play out, not able to comfort my child’s painful regret. He cried, rolling around on the floor so sadly for almost 40 minutes… then finally, when he was ready and on his terms… asked me if I would hold him, which I did quickly. It took some time for him to “get over it” but he eventually did. He went on with his day seemingly happy until dinner time when we played our around the table game “Mad, Sad, Glad” where each of us tell one thing that made us feel each feeling that day. When it was his turn, he remembered the sadness of missing his Thomas Coach and the whole thing started over. It took about 20 minutes for him to ask for a hug that time and before long, he was back to normal again. I guess that is how it is for me when I think about the things I regret doing or not doing. The gut-wrenching sadness is overwhelming and feels as though it will last forever but, of course, it passes eventually. Each time I am reminded of it after that, the pain lessens slightly. I don’t think God wants me to have regrets that last longer than that initial burst. I think God knows my heartache and has great compassion for me, just as I did as Brett’s mother watching him work through it. I think God is willing to do whatever it takes to make me feel better but I am just like Brett. I roll around on the floor not wanting to be comforted. I want my misery! Assuming there is someone still hanging around by the time I’ve had enough self-pity, I request a hug, but it’s on my terms. To me, regrets are sort of like the unused stuff I let pile up around the house… if they aren’t fulfilling a need in my life, it’s time to let them go. One of my favorite 12 step sayings is this, “If you’ve got one foot in yesterday and one foot in tomorrow, you’re in the perfect position to crap all over your today.” To me, regrets are part of yesterday and have no place in my tomorrow so I have to make the choice to let God comfort me today, in His way, on His terms. His terms are so simple but I complicate them terribly… I believe His terms are… give it once and let it go. The cool thing about God is that unlike a mother who watches helplessly as her child agonizes, He can remove the pain part of regret if I let Him. The memories will remain, as a gentle reminder of what once was, but the pain that was once attached… can just flitter away. If it doesn’t, then the only one I have to blame is myself for not letting Him take it. In closing, I believe God wants me to find rest and peace in Him. He gave His Son, to me, as a person in need. It hurt Him deeply to make that sacrifice because Jesus wasn’t just an extra chair sitting around the kingdom that God didn’t need anymore. I think by accepting God’s comfort on His terms, I am actually glorifying the sacrifice He made. When I come to Him and allow Him to lift my regret, comfort my pain and soothe my roll-around-on-the-floor restless pangs… He knows it was worth it. 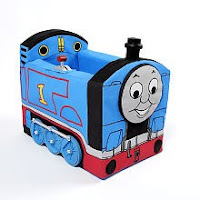 In short, I know without doubt that God will never want His “Thomas the Train Whistle and Wheels Couch” back, so I’m going to do my best not to waste the gift He gave me. My husband and I were looking to buy a new house, not because we needed a house, but because we wanted something bigger and better at a good deal. There was this one house we thought would be perfect so we asked our real estate agent to take us to see it. Before arriving, our agent warned us not to get too interested in the house because there were some legal issues surrounding the “owners” of the house; yes the house was for sale but there was some question as to who actually owned the house. Until that got figured out, nothing could happen. Our agent confided in us that he didn't believe the house would be able to be sold. Right before we went inside, we were given one more piece of information: we were told to ignore the tigers that lived there. HUH? Tigers??? Yes, there were two REAL full-size tigers that roamed freely in the house. Our agent assured us if we ignored them, they wouldn't bother us so it was safe to go in. Okay.... in we went. To summarize: we want a bigger, better house but don't need it, the house we are looking at doesn't appear to even be available and we enter the house even though we have full knowledge there are two tigers inside. Hmmmm... we aren't sounding too smart, are we? So we go in. Immediately I see one of the tigers in the living room. It was curled up sleeping soundly on the floor. It looked cute... big, but cute. We looked around, loved what we saw (aside from the tiger) and moved on to see the rest of the house. My husband and I finished looking around without ever seeing the other tiger. We left without incident. Despite the tigers, we really liked the house. We decide we want it knowing that it probably isn't available. Perhaps this is one of the reasons we really want it. How human of us! Next thing I knew we are back in the car with the agent to go see the house again. This time we have brought some friends with us to see what they think of it. We were so excited, telling our friends all about this perfect house we just have to have. We waited until we got to the front door to tell them about the tigers, and we told them as though it were no big deal. Our friends looked at us like we were completely insane and refused to enter the “den of pending death.” Finally, someone with some intelligence! It took some convincing, but we finally talked them into going in with us. Again, there was a tiger sleeping in the living room. Our friends were totally freaked out but we tip toed around the big animal and moved on to see the rest of the house, still no sign of the other tiger. We’re almost ready to leave but one of my friends was missing so we got a little worried. We found her in the living room staring at the sleeping tiger. Her fear of the animal had been replaced by intrigue. We warned her of the danger as she got closer and closer to the tiger but she didn't listen. Her fear didn't seem to exist anymore... her fear had become false confidence that nothing could happen to her. She reached her hand out slowly to touch the sleeping animal as we watched in petrified horror. In slow motion I saw the tips of her fingers stroke the fur for this first time. As if shocked herself, she smiled as she continued to stroke the tiger’s soft hair. She knelt and continued. One by one, each of us began to relax as her affection of the animal seemed to be accepted without problem. Before long she was scratching the large cat behind the ear, as the resting animal purred loudly appearing to enjoy the attention. It was time to leave, so we began to head out the door. My friend was happy to have had a chance to be so close to such an amazing creature. It was a once in a lifetime experience she was pleased to have had. She was smiling and proud she conquered her fear. She felt invincible as she rose to her feet and took a final look at the motionless, giant, sleeping cat. With a sigh of relief that the petting was over, I waited for my friend to walk out the front door. She turned her back away from the tiger with a giant smile on her face and began to leave. Just when all seemed perfect, the tiger awoke to see my friend walking away. In the blink of an eye the tiger stood, snapping out his massive paw, and grabbed my friend. His claws tore into the flesh of her back. Her face changed from joy to shock and then to torturous pain. I stood witnessing the animal dragging her back into his full grip. I watched helplessly knowing he would devour her without guilt, for that was his nature. My sleeping tiger dream faded to black and was thankfully over. This dream means many things to me personally... I have played all of these roles within this dream many times in my lifetime: the consumer driven by want rather than need that flippantly draws others close to danger, the homeowner who is trying to sell something they do not own, the middleman agent who speaks the truth yet does nothing for the sake of prevention, the once cautious yet curious friend who is drawn to danger and ultimately consumed as a result, and the ultimate predators - the tigers (the one in view AND the one in hiding). I'm thankful the Spirit cares for me enough to take the time to make me aware of the role I am playing right now. I don't like it, but it is the truth. I know the only way I can do better is to see the truth. In short, we can pretend it is only a dream but I believe awareness of the role we play in every situation is the only way to keep from being devoured by the tiger. And just so you know, I also believe the ultimate way to be devoured by the tiger is to make the choice to be the tiger. Guess what? I recently learned the answer. What’s funny is I didn't even realize I didn't know the answer until I learned what it was. Personally I don't think there is anything wrong with just believing something without knowing the details, as long as we are Spirit-guided. In fact, for me, Bible study requires and incredible amount of blind faith since I recognize I am simply unable to comprehend the meaning of most scripture with my feeble human brain, and that is okay! I was so excited when this particular blind faith “gap” was filled in with perfect understanding. So excited I just had to share it!!!! Back in Jesus' time, crucifixion was only one of many ways in which criminals were executed. Each crime had its own type of punishment. For example, in Jewish law if a person committed blasphemy against God, they were to be stoned. The actual offense Jesus was “found guilty” of was blasphemy. According to the Jewish rules of execution, Jesus should have been stoned to death. So what happened? Well, the Romans decided to take it up a notch for Jesus, so they up’d the charges to make a point. Crucifixion was seen as the most humiliating way for a criminal to die. It was an extremely public, torturous, drawn out process but that wasn't why it was considered the worst way to go. It was the worst way to go because of what it meant... if you were crucified it meant that you were cursed by God. Did you just read that? Cursed by God! Your sins were unforgivable and you had no hope for salvation. God had thrown you away like trash, you were an embarrassment to His kingdom and He had no use for you. You were burnt toast, and not even the kind you can scrape with a knife and still eat... you were the kind that stunk up the whole house and went straight to the Glad bag under the sink. Wow... the King of Kings, the Son of Man, the Great I Am, the Way, the Truth, the Light, Jesus Christ – Son of the Father was sentenced to death, physical and spiritual... cursed by God, no hope for salvation, toast in the trash can when in reality, He was perfection. I look at myself in the mirror after reviewing the 10 commandments and I say “oh crap!” Jesus told us the two most important commandments are “Love the Lord your God with all your heart” and “Love they neighbor as thyself” (Matt 22:36-40). The night before his crucifixion, Jesus made a slight change to that second one... he instructed us to love each other the way He loves us... with perfect love. (John 13: 34) I admit it, I am a failure at this (and so many other things). I require much forgiveness every single day. If there is anyone who deserves to be cursed by God... it is me... tacked up on a cross for all the world to see and spit on. I am left in awe when the puzzle pieces come together and I see the strangely beautiful picture that shows me I WILL NEVER BE CURSED BY GOD…even though I deserve it more than I can ever fathom. This is all because Jesus took that curse on my behalf. It is only because of His perfect love and obedience that I have the chance to start over at anytime, asking God for a clean heart and a renewed Spirit. Again I am in awe that Jesus took that curse for me; a thankless, selfish dirtbag who is sitting here hemming and hawing over something so ridiculous that it amazes me I'd even put my salvation on the line for a second over it. Thank you Jesus for having the strength, conviction, and perfect selfless love to trade Your dreams for God's… without pause. It is because of You, I am loved and forgiven, regardless of the fact that I am a dirtbag. Have you ever been annoyed with someone? Well that’s a stupid question isn’t it… of course you have. In fact, you’re probably annoyed at me right now for asking such an annoying question. Let me be more specific… have you ever been annoyed in a very subtle yet intense way? Does that make sense? I mean you know you love them, because you do… you love them… and not because you have to, because you honestly love them (and no I’m not talking about my husband right now). Yet, you are so terribly aggravated by them that you wish you could just… hate them???? It doesn’t ruin your day or make you fly into a rage or anything. It just kind of sits in the back of your mind as you go about your daily routine. You smile and function just fine yet you know its there and every once in awhile it flairs up and you just have to clench your fist for a moment and say “Argh!” I for one try very hard not to have my “Argh” sound like a pirate… I prefer a gravely, throaty “Argh” with umph. So maybe you know what I mean, maybe you don’t. Either way I bet you’re wondering who it is and what happened, right? Maybe it’s you???? Well, I won’t go into specifics here, because they aren’t important to the point. (Sorry to let you down.) What I will do is tell you that I really don’t like feeling this way at all. It is quite disruptive to my overall serenity, so I better deal with it. Digging in deep I realize I am so annoyed with this person because they are exhibiting behaviors that I once embraced myself. In fact, I’m looking at this person and wondering if I am looking into some freakish mirror that reflects the ghost of Wendy past. It is so very annoying to see what I used to be like! It is so very annoying to deal with what I used to make other people deal with. I swear, I don’t know how people put up with me!!!! I recognize I probably deserve this and I also recognize this is one of the ways God reminds me to be careful and keep making progress in my life. I’ve prayed some about this but for some reason, I haven’t really given it a good hearty prayer. I don’t know why… maybe I’m just leaning on the assumption that God knows how I feel so I don’t really need to explain it to Him. Maybe I think He should just help me out without me having to go into too much detail about it. I have asked my husband to pray FOR me, since I seem to not be able to “get it out” the way I should. I suppose what I realize right now more than anything is that now is the time to practice this thing called true love. If I do in fact love this person, and I do, I must remove the string labeled, “only when you do what I want you to do” that I have attached to that love. I must look at the scripture and take it to heart. A person once explained true love to me in this way… true love is when we want God based self-love to be real for another person. I like that explanation a lot. It means it’s not about “me.” It’s about them, their well-being and their connection with God and if that is truly the case then it can’t be anything other than what scripture says. I know that this person struggles with self-love. I think we all do in ways. I make the choice right now to be patient, kind, humble, polite, selfless, satisfied, forgiving, honest, loyal, protective, hopeful and lasting in my prayer for self-love for… you, person who has annoyed me because you are a lot like me. After all, I’m sure I’ve annoyed you before. Moreover, Jesus loves me in this way better than anyone ever could (and I bet I’ve annoyed Him plenty). I owe it to Him, given all He has done for me, to at least try and pay it forward. Funny, I don’t feel as annoyed now.